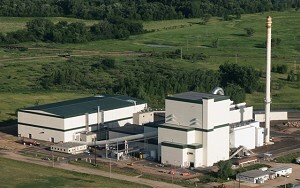 1 Caption: Fibrominn, the first poultry litter-fueled power plant in the U.S., opened in Benson, Minnesota, in 2007. 2 Did you know that cars can run off the energy from peanuts? Did you know electricity can be made from bamboo? These are examples of biopower. Biopower is using plants or animal products to make energy. Biopower is good for the environment. It uses natural materials or waste products that might otherwise be thrown away. It creates little or no pollution. And it emits less carbon dioxide than fossil fuels. Carbon dioxide emissions are the cause of global warming. Unlike fossil fuels, sources of biopower can easily be replenished so that supplies will never run out. They are renewable resources. 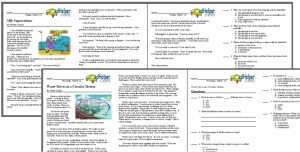 3 Where does biopower come from? Some of the sources are probably familiar to you. Some may come as a surprise. Wood has been an important fuel since humans learned how to harness fire millions of years ago. In some developing nations, wood still provides more than 80% of people's heating energy. 4 Plants like bamboo are perfect energy crops. They grow very fast. When burned as fuel, these plants release only as much carbon dioxide gas as they absorbed while growing. As they do not release any extra carbon dioxide into the atmosphere, they do not add to global warming. Feedback on Biopower - the Answer to the Oil Shortage?